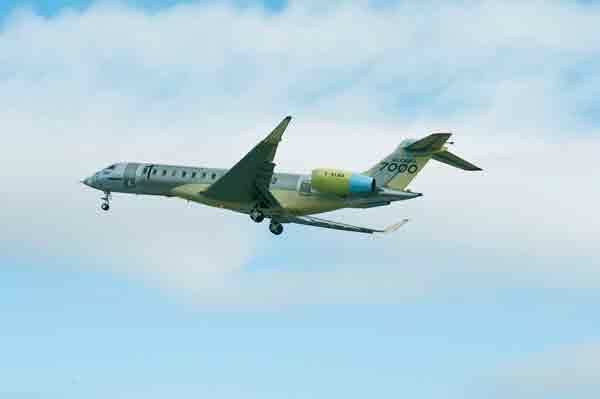 Bombardier Business Aircraft announced that its segment-defining Global 7000 aircraft program completed the successful maiden flight of its first flight test vehicle (FTV1). This first flight marks the start of a flight test program for the newest member of Bombardier’s flagship Global aircraft family, which is scheduled to enter into service in the second half of 2018. The Global 7000 flight test vehicle took off from Bombardier’s facility in Toronto under the command of Captain Ed Grabman, assisted by his co-pilot, Jeff Karnes and Flight Test Engineer Jason Nickel under clear conditions at 10:25 a.m. EST. Dedicated to testing basic system functionality and assessing the handling and flying qualities of the aircraft, today’s flight lasted approximately 2 hours and 27 minutes, during which all flight controls were exercised, and the systems and aircraft performed as expected. The flight crew conducted a gradual climb to 20,000 feet (6,096 m) and the aircraft reached a planned test speed of 240 knots. "The first flight is the culmination of an incredible amount of knowledge and experience from our dedicated employees, partners and suppliers,” said David Coleal, President, Bombardier Business Aircraft. “This is a very proud moment for Bombardier and confirms the Global 7000 aircraft program development is on schedule. It is the industry’s most innovative and uniquely designed business jet and the only aircraft on the market to offer four living spaces for unparalleled comfort and flexibility, creating an unforgettable experience for our customers. The Global 7000 business jet’s impressive capabilities promise to establish a whole new category for large business jets,” he added.